This year’s Viewer’s Choice Challenge will be Back To Basics – 9 Patch. 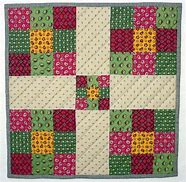 Nine Patch is one of the most basic quilt blocks consisting of nine equal squares sewn three across and three down utilizing 4 squares of one color and 5 squares of another. The creativity is utilizing this block as the basic for making a quilt. The block can be cut and rearranged in any fashion, but must start with the basic nine patch block. The most common variation is the disappearing nine patch. Other variations can be found on the intranet or use your creativity.